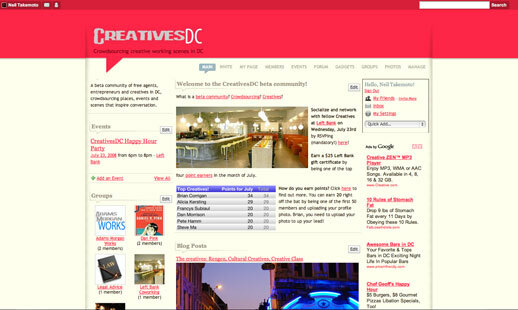 CreativesDC launched July 11, 2008 and its founding dozen members have already invited 100 of their fellow creatives (assume a 10% conversion rate) – that’s the power of community focused on a vision. By the end of July 15, the invite list will hit a thousand (again, a 10% conversion rate, resulting in a 100 new members in about a week) as local ‘gatekeepers’ organize a kickoff party on July 23. This is an example of the viral loop. What’s the point? One longtime wistful request of the innovators in DC has been a forum to meet one another, even collaborate. What CreativesDC provides is not only an opportunity to provide that, but the means to create, as stated, the actual places (eg a design-oriented coworking site), events (eg monthly happy hours) and scenes (eg an active daytime entrepreneurial population) that represent those collaborations – via its groups. This can easily be replicated in other cities. Update: The group membership stands at over 350 a few month later, as of November 2008.